Many food-related and beverage-related tanks are piped with stainless steel or metal pipes that must be cleaned regularly to keep out bacteria, because the stored material will eventually be consumed by humans. FDA regulations establish standards for maintaining a clean and bacteria-free product, and CIP tanks help meet those standards. Because industrial wastewater comes from labs and other industrial locations, it can contain chemicals that are harmful to sewage systems and wastewater treatment plants. Many chemicals, such as sodium hypochlorite (bleach), can kill bacteria but don’t remove process chemicals, so it’s important to introduce chemicals that can clean the wastewater properly. Cone-bottom tanks are common in CIP systems, but a full-drain IMFO Tank® may be a better option for you. The IMFOTank avoids many common issues by preventing particulate buildup or trapping a remnant of cleaning fluid from fully draining. The IMFO is a true, 100 percent full-drain tank, because the outlet flange is molded below the two-inch knuckle radius. 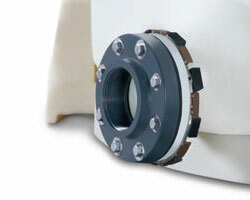 No other vertical tank features an outlet flange below the knuckle radius. With the IMFO, you also get peace of mind that the outlet flange is guaranteed leak-free, because it’s molded into the wall. Other flanges are welded, glued, bolted, or otherwise attached using secondary materials and attachment process. These methods leave the attachment point susceptible to leaking over time. A SAFE-Tank® is also a good choice, because the tank-within-a-tank (or double-wall) structure of the SAFE-Tank allows you to keep an acid tank and a base tank in the same area without the risk of contamination. Any leaking or spilling is safely contained within an interstitial area between the tanks double wall. There is no risk of acids and bases coming in contact with one another. As part of the clean-in-place process, a detergent is usually run through the lines. Detergents and surfactants, like caustic soda, are particularly corrosive and can break down linear polyethylene—but not crosslinked polyethylene (XLPE). An XLPE tank will safely avoid cracking and breakdown of tank materials that could lead to a potential leak. Crosslinked tanks are inherently stronger, and withstand the damaging effects of surfactants. Storing ultra-high purity cleaning chemicals also requires an interior surface that resists bacteria growth. Unlike a typical porous stainless steel tank, Poly Processing’s OR-1000™ Tank resists bacterial growth inside the storage tank. Our OR-1000 adds an antioxidizing interior barrier between the chemical and the crosslinked polyethylene. The OR-1000 is bonded to the crosslinked polyethylene during the manufacturing process, creating a seamless, covalent bond that will last the entire life of the tank. Specialty food grade fittings and gaskets, like a spray ball, complete the specifications for your clean-in-place chemical storage system. For ultra-pure cleaning chemicals, fittings and gaskets should all be made of PVC, stainless steel, PVDF or even Teflon. The IMFO® system is also ideal for clean-in-place systems, because it allows for a full drain of the tank without the chemical contacting any metal hardware. Poly Processing has years of proven experience working with major food and beverage firms and national chemical suppliers. As a result, we bring extensive industry knowledge to provide safe, efficient, cost-effective storage of clean-in-place chemicals and cleaning agents. 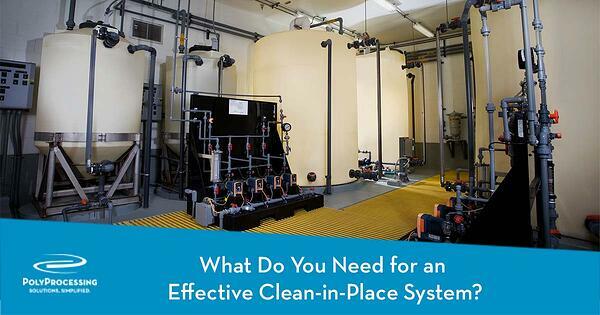 If you have questions about clean-in-place solutions, contact a chemical storage tank expert today. 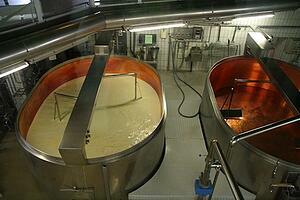 Photo Credit: "Cheese Production" via Wikimedia Commons cc.